I joined Skoltech as a Leading Research Scientist in 2017 to work on the project “Integration and control of heat and power systems with variable loads” funded by the Next Generation SkT-MIT programme. I was promoted to a faculty position in 2018. I work on a variety of scientific projects: I now assume the role of Principal Investigator of our SkT-MIT Next Gen project on the Skoltech side, where we focus our efforts on indoor microclimate control both on experimental and theoretical levels; I also happily take a very active part in various projects pertaining to other fields of science such as nonequilibrium thermodynamics, quantum physics, physical chemistry and biology. I am a co-Chair of the Engineering Systems PhD Program Committee, in charge of the Energy Systems PhD program, and member of the Skoltech Educational Committee. At Skoltech, I develop and deliver two graduate courses: Energy systems physics and engineering, and Nonequilibrium processes in energy conversion. My postgraduate education is in theoretical physics, with a Master’s degree in statistical physics (Université de Cergy-Pontoise, France, 1997) and a PhD in physics (Heriot-Watt University, UK, 2002), focused on the modeling of ultrafast pump-and-probe experiments with spin-selective excitation in semiconductor quantum wells, and on two-dimensional scattering theory to study photon emission via exciton recombination. I have a research experience of over fifteen years at postdoctoral level in four countries, including the United Kingdom, Ireland, France, and Russia. My works fall within the broad category of theory and numerical modeling of condensed matter and dilute systems, mostly addressing problems pertaining to energy conversion physics, coupled transport theory, scattering theory of excitons and of ultra-cold atoms, and light-matter interactions. In the recent years, I developed a strong interest for energy-related problems and theories of irreversible thermodynamics, with a particular focus on thermoelectric systems. My experience in research thus covers different fields of theoretical physics that have a close relation to experimental activities. Many of my works were performed as part of international collaborations with theoreticians and experimentalists, and more recently with industrial partners, including EDF, a major French electric utility company. As of now , I am principal and key co-author of 60 research publications on a wide range of topics in the physical sciences. Some of my recent works were highlighted by journals and in the Europhysics News. I am also an active referee for several major international peer-reviewed physics journals, and I served as a referee for the French National Research Agency for the Physics Committee to evaluate the progress of the funded projects of the 2009 programme “Theoretical Spectroscopy and Radiation-Matter Interactions”, and for the Sustainable Electricity Production and Management programme of 2012. I have a significant experience of teaching and supervision in higher education systems, primarily as a first-year tutor at Heriot-Watt University, Edinburgh, during my PhD studies, and as a temporary lecturer at the University of Caen, France (2004-2006) covering a wide range of topics of the physics curriculum essentially at undergraduate level. I also taught and personally supervised students at undergraduate and postgraduate levels while I was employed as a senior research associate (in 2007 and in 2011-2014). Moreover, I was actively involved in the daily supervision of one PhD student (2011-2013) and one junior postdoctoral researcher (2012-2013). To complement my education and gain valuable and useful transferable new professional skills, I undertook a one-year training and gained a first-class postgraduate Master’s of Art (Université de Caen, France, 2016) to qualify as a European project manager. Integration and control of heat and power systems with variable loads — microclimate control based on model predictive control approaches. Thermodynamic models of biological systems — metabolic energy production and conversion to muscular mechanical energy. Physical and chemical properties of water — development of new models of liquid water and electrical conductivity of aqueous solutions. Open quantum systems – development of analytical and numerical methods based on tensor networks. Engineering thermodynamics — Stirling cycle for refrigeration applications. For more details, check out the information available under each heading above, and the news in particular. I am happy to receive feedback, comments and questions any time by email. Picture of my research group and of my current collaborators for pedagogical activities. “Simulation complexity of open quantum dynamics: connection with tensor networks”. Physical Review Letters, accepted for publication, in press (2019). “Experimental study of a high-tolerance piston-cylinder pair in the alpha Ross-yoke Stirling refrigerator”. “Thermodynamics of metabolic energy conversion under muscle load”. “Model predictive control of indoor microclimate: existing building stock comfort improvement”. “True nature of the Curzon-Ahlborn efficiency”. “The thermoelectric working fluid: Thermodynamics and transport”. “Continuity and boundary conditions in thermodynamics: From Carnot’s efficiency to efficiencies at maximum power”. Invited article to the Discussion and Debate The Carnot Principle Revisited: Towards New Extensions? “Debate. Continuity and boundary conditions in thermodynamics: From Carnot’s efficiency to efficiencies at maximum power”. “Debate. Maxwell demons in phase space”. “Debate. Thermodynamics of the general diffusion process: Equilibrium supercurrent and nonequilibrium driven circulation with dissipation”. “Revisiting Feynman’s ratchet with thermoelectric transport theory”. “On the efficiency at maximum cooling power”. “From local force-flux relationships to internal dissipations and their impact on heat engine performance: The illustrative case of a thermoelectric generator”. Reply to the Comment on “Optimal working conditions for thermoelectric generators with realistic thermal coupling”. “Efficiency at maximum power of thermally coupled heat engines”. “Irreversibilities and efficiency at maximum power of heat engines: The illustrative case of a thermoelectric generator”. “Optimal working conditions for thermoelectric generators with realistic thermal coupling”. “Small signal model for frequency analysis of thermoelectric systems”. “Statistical analysis of the figure of merit of a two-level thermelectric system: A random matrix approach”. “A note on the electrochemical nature of thermoelectric power”. “Enhanced thermoelectric coupling near electronic phase transition: the role of fluctuation Cooper pairs”. “Structural analysis of strained LaVO3 thin films”. “Equivalent parameters for series thermoelectrics”. “Influence of thermal environment on optimal working conditions of thermoelectric generators”. Comment on “Effective thermal conductivity in thermoelectric materials”. “Mesoscopic thermoelectric transport near zero transmission energies”. “Thermoelectric internal current loops inside inhomogeneous systems”. “Analytic model of effective screened Coulomb interactions in a multilayer system”. “Coulomb singularities in scattering wave functions of spin-orbit-coupled states”. “Polariton-polariton scattering in microcavities: A microscopic theory”. “Photon emission induced by elastic exciton-carrier scattering in semiconductor quantum-wells”. “Barnes slave-boson approach to the two-site single-impurity Anderson model with non-local interaction”. “Kinetic phase diagrams of GaN-based polariton lasers”. “Bose glass and superfluid phase transitions of exciton-polaritons in GaN microcavities”. “Slave bosons in radial gauge: a bridge between path integral and Hamiltonian language”. “Bose glass and superfluid phases of cavity polaritons”. “Scattering states of coupled valence-band holes in point defect potential derived from variable phase theory”. “Alloy scattering of n-type carriers in GaN_xAs_1-x”. “Ultrafast pump-probe dynamics in ZnSe-based semiconductor quantum-wells”. “Parameters for cold collisions of lithium and caesium atoms”. “Error cancellation in the semiclassical calculation of the scattering length”. Radiolysis of water confined in porous silica: a simulation study of the physico-chemical yields”. Comment on “Scattering length for fermionic alkali atoms”. “Dependence of the scattering length for hydrogen atoms on effective mass”. “S-wave and p-wave scattering in a cold gas of Na and Rb atoms”. “S-wave scattering lengths and effective ranges for collisions of ground state Be atoms”. “Scattering parameters for cold Li-Rb and Na-Rb collisions derived from variable phase theory”. “The variable phase method used to calculate and correct scattering lengths”. “Elastic scattering of cold rubidium and caesium atoms”. “Transient thermoelectric generator: An active load story”. “Internal convection in thermoelectric generator models”. “Spin-dependent polariton-polariton scattering in planar microcavities”. Thermoelectrics for Power Generation – A Look at Trends in the Technology, pp. 511-539. Continuum theory and modeling of thermoelectric elements, pp. 157-176. Continuum theory and modeling of thermoelectric elements, pp. 75-156. Continuum theory and modeling of thermoelectric elements, pp. 1-74. “A linear nonequilibrium thermodynamics approach to optimization of thermoelectric devices”. Invited chapter in Thermoelectric Nanomaterials, K. Koumoto et T. Mori Editors. Techniques de l’Ingénieur, BE8080 (2013). 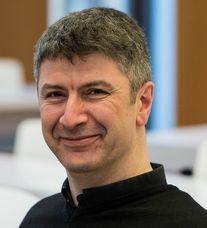 Research interests: condensed matter physics; classical, irreversible, finite-time, quantum, and statistical thermodynamics; scattering theory: ultra-cold atoms, carriers in solid-state systems; applied physics: energy systems. * L’euro concurrent du dollar? (The euro, a contender of the US dollar? ) — Master’s project in economy, with Léa Minier, 24 pages + appendices (Université de Caen; 2016). * Conditions de réussite d’un projet issu des SHS à un appel à projets Horizon 2020 (Conditions for success of a social sciences & humanities (SSH) project in a Horizon 2020 call) — Master’s project in European project management, with Héloïse Blandin, Joséphine Rosès, Jean Baptiste Morin and Marie-Laure Lacides, 48 pages + appendices (Université de Caen; 2016). Guest scientist in the Quantum Polaritonics Group of the Russian Quantum Center (2014). Examiner for PhD defence of Dr. Yann Apertet, Institut d’Electronique Fondamentale, Université Paris-Sud, Orsay, France (13/12/2013). Referee for 15 peer reviewed international physics journals, including Nature Energy, the Physical Review Letters, the Physical Review A, B, E, Applied Physics Letters, Journal of Applied Physics, Journal of Low Temperature Physics, The European Physical Journal B, Journal of Luminescence, The Central European Journal of Physics, Optical and Quantum Electronics, Entropy, Energy Conversion and Management, Physica A. Expert referee for the French National Research Agency, for the PROGELEC (Production Renouvelable et Gestion de l’Electricité / Sustainable Electricity Production and Management) programme of 2012, Paris, France (04/2012 – 05/2012). Referee for the Physics Committee (Comité Scientifique Disciplinaire – CSD 4 – Physique) of the French National Research Agency to evaluate the progress of the funded projects of the 2009 programme “Theoretical Spectroscopy and Radiation-Matter Interactions”, Paris, France (10/04/2012). Member of the Quantum Transport and Thermodynamics Society. Member of the Mediterranean Institute of Fundamental Physics, Rome, Italy. Departmental Scholarship for the doctoral degree (full fees plus living allowance) from the Physics Department at Heriot-Watt University, Edinburgh, UK (1998 — 2001). * On the 3rd of April 2019, our article: “Simulation complexity of open quantum dynamics: connection with tensor networks” was accepted for publication in the Physical Review Letters!!! 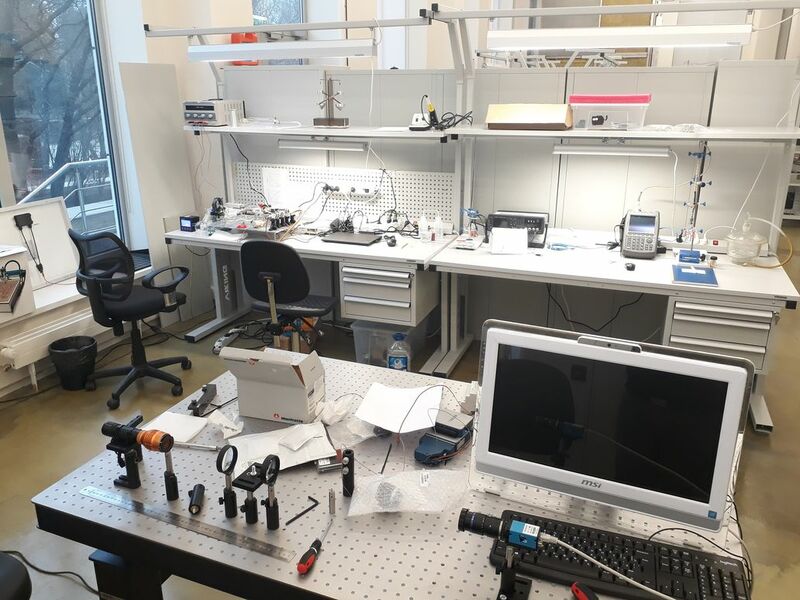 * 2rd of April 2019, our experimental setups for dielectric spectroscopy (back of the picture) and heat exchange (front of the picture) are shaping up nicely! In a nutshell, with Vasily Artemov we lead experimental studies of the water molecule lifetime in gas phase and liquid water focusing on proton dynamics measuring the speed of proton exchange in condensed water by the detection of HDO molecules formation speed after interaction of the water H2O and D2O isotopologues; we also lead experimental studies on the influence of pore size on the dielectric properties of confined water in meso- and nanoporous matrices by characterization of anomalously high electric conductivity and low dielectric constant compared to bulk water. With Yuriy Lyulin we develop experiments to study heat transfer in two-phase vapour chambers for power and micro electronics as the evolution of electronic systems requires higher levels of cooling efficiency larger than 500 W.cm-2 ; works include the design and fabrication of micro- and nanostructured surfaces having hydrophobic, hydrophilic and gradient wettability properties and the measurements of the thermal resistance and heat transfer performance of vapour chambers. * On the 14th of January 2019, the French Minister of Higher Education, Research, and Innovation, Mme Frédérique Vidal, the Ambassador of the French Republic to Russia, Mme Sylvie Bermann , among a high-profile French delegation, visited Skoltech, exchanged views on research, education and innovation with Skoltech President Kuleshov, and discussed prospects for future fruitful collaborations, in particular with INRIA, the French leading research institute for digital sciences. 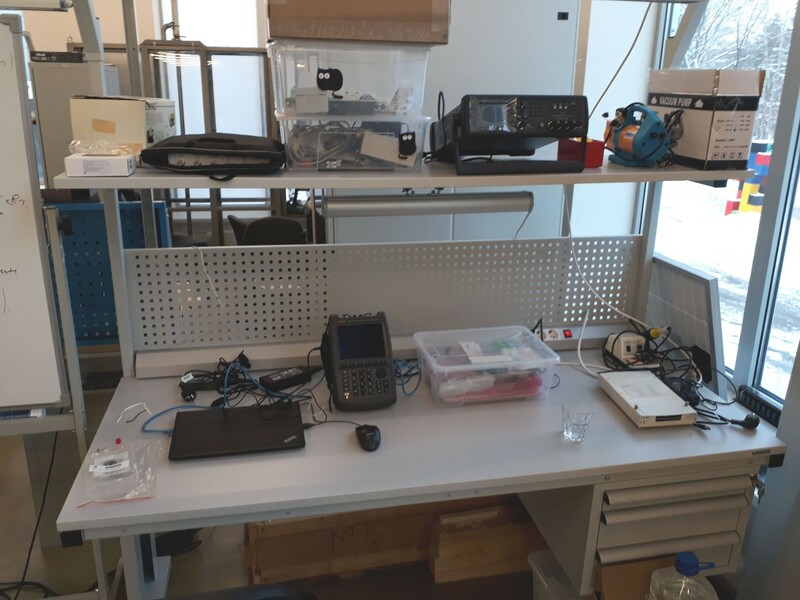 * On the 11th of January 2019, our low-frequency (20 Hz — 2MHz) and high-frequency (300 kHz — 18GHz) impedance analyzers were delivered to our lab! We also received some other hardware such as a high-temperature dielectric probe kit, etc. 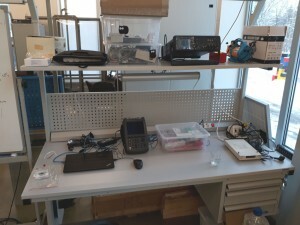 + all the stuff necessary for data acquisition and processing. I am very very happy! We have loads to do to get the experimental setup up and running, and this is going to be quite fun and promising. * Three students from our Energy Systems Master, Roman Doronin, Ilya Khomchenko, and Valery Shevchenko, joined my group to initiate research works starting on the 9th of January 2019: Roman will work with Dr. Vasily Artemov on the development of our new Dielectric Lab to perform dielectric spectroscopy experiments with water and electrolytes; Ilya will work with me on the thermodynamic and transport properties of quantum gases for energy applications; Valery will work with Dr. Lyulin on the development of the Thermal Lab to perform experiments on heat transfer in two-phase vapor chambers for power and micro electronics. * On the 30th of November 2018, together with my PhD student Ilia Luchnikov and our collaborators, Stepan Vintskevich and Sergey Filippov, at the MIPT Laboratory of Quantum Information Theory, we submitted our article: “Simulation complexity of open quantum dynamics: connection with tensor networks” to the Physical Review Letters. The arXiv version is available here. 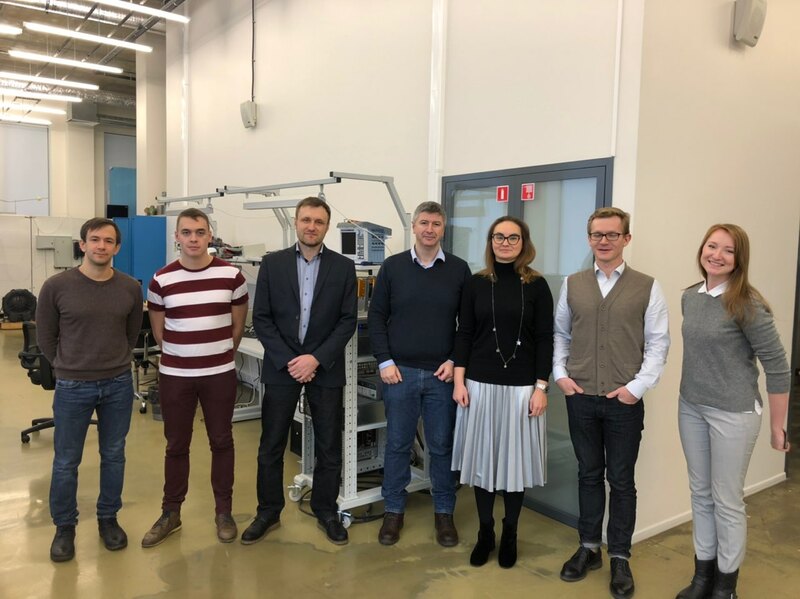 * On the 30th of November 2018, together with Alexei Kiselev of the Institute of Meteorology and Climate Research, Atmospheric and Aerosol Research at the Karlsruhe Institute of Technology, Germany, we submitted our joint project: “Electric properties and structure of water near natural interfaces ” to the Helmholtz Association – Russian Science Foundation in the frame of the call: Helmholtz RSF Joint Research Groups, in the area of “Structure and dynamics of matter”. 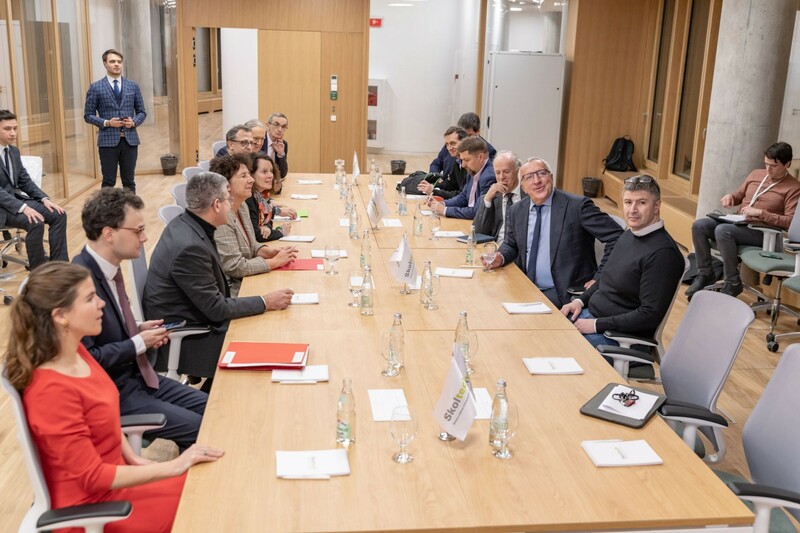 * On the 29th of November 2018, together with my French collaborators, Christophe Goupil and Eric Herbert (LIED – Paris Diderot University), Yves D’Angelo (Laboratoire J. A. Dieudonné, Nice Sophia-Antipolis University) and Clémence Goupil (Hôpital Hôtel-Dieu, Assistance Publique/Hôpitaux de Paris), we submitted our article: “Thermodynamics of metabolic energy conversion under muscle load” to the New Journal of Physics. * On the 8th and 9th of November 2018, my PhD student Dmitry Smirnov participated to the International Conference on Future Breakthroughs in Science and Society — “Falling Walls Lab“, in Berlin, Germany. * On the 29th of October 2018, I started teaching my 6-credit course “Energy systems physics and engineering” — see syllabus here. * On the 15th of October 2018, our article: “Model predictive control of indoor microclimate: existing building stock comfort improvement” has been accepted for publication in Energy Conversion and Management! Since October 26, 2018, it is available online through the doi link: 10.1016/j.enconman.2018.10.046. * On the 1st of October 2018, our new colleague Dr. Vasily Artemov, joined my group at Skoltech. Vasily’s main research activities will be devoted to the experimental and theoretical studies of water and aqueous solutions for energy applications. Part of his work is done in collaboration with the University of Stuttgart, Germany, where he has performed dielectric spectroscopy experiments of water confined in porous media. * On the 12th of September 2018, our new colleague Dr. Yuriy Lyulin, joined my group at Skoltech in the frame of our Next Generation project. Yuriy’s main research activity will be devoted to the problem of heat transfer in two-phase vapor chambers for power and micro electronics. * On the 11th of September 2018, Dr. Alexander Ryzhov and I presented our “innovation project” at the Innovation Workshop held at Skoltech during the whole month. Our challenge, which is related to our work on indoor microclimate control in the frame of our “Next Generation project”, is to design a smart microclimate control systems that adapts in real time to the state of the power grid to avoid adding to the peak demand problem while energy-efficient solutions for comfort are implemented by the control system. Click on the link to download the 10-minute presentation slides. * On the 8th of September 2018, together with my PhD student Dmitry Smirnov, and our collaborators at Peter the Great St. Petersburg Polytechnic University, and the company Thermal Motors, we submitted our joint article: “Optimal piston sealing for Stirling refrigerators: Experimental study of a high-tolerance piston-cylinder pair” to the Internal Journal of Refrigeration. The paper is under review. * My PhD student Dmitry Smirnov won the Falling Walls Lab Moscow competition on June 6, 2018. Dmitry will present his works on the Stirling cyle-based shock freezer at the International Conference on Future Breakthroughs in Science and Society in Berlin, 8-9 November, 2018. * On the 25th of June 2018, together with my Skoltech colleagues Dr. Alexander Ryzhov, Prof. Aldo Bischi, Prof. Elena Gryazina, and our MIT collaborator Prof. Konstantin Turitsyn, we submitted our joint article: “Model predictive control of indoor microclimate: existing building stock comfort improvement” to Energy Conversion and Management. The paper is under review. * In April 2018, I was promoted and moved on my new position as Assistant Professor at the Skoltech Center for Energy System. * 5th of March 2018: the first phase of the Polygon development is finished. The Polygon is the experimental facility we designed and built in room 403 of the blue building, to experimentally study indoor microclimate control, and in time collect data to feed machine learning algorithms for AI-based approches to control. The Polygon is fitted with sensors (CO2, temperature, humidity), people counter, and actuators (radiators and HVAC) connected to a dedicated server for data acquisition and processing. The success of this first phase owes much to the efforts of Dmitry Zhestkov and Alexander Ryzhov. * On the 28th of July 2017, our joint article with Yann Apertet: “Small-signal model for frequency analysis of thermoelectric systems” was been accepted for publication in Energy Conversion and Management. Since the 4th of August 2017 , it is available online through the doi link: 10.1016/j.enconman.2017.07.061. * On the 27th of July 2017, our joint article with Yann Apertet (formerly Institut d’Electronique Fondamentale, now C2N, Orsay, France), Christophe Goupil (LIED – Paris Diderot University) and Philippe Lecoeur ( C2N) : “True nature of the Curzon-Ahlborn efficiency” was accepted for publication in the Physical Review E. Since the 9th of August 2017 , it is available online through the doi link: 10.1103/PhysRevE.96.022119. * On the 1st of June 2017, Dr. Alexander Ryzhov joined our team to work in the frame of our project “Integration and control of heat and power systems with variable loads” funded by the Next Generation SkT-MIT programme . Alexander’s efforts will be focused on the development of a model predictive control approach to indoor microclimate control. He will also help with the design and setup of the future dedicated experimental facility at Skoltech. * In February 2017, I officially joined the Skoltech Center for Energy System on a Leading Research Scientist position to work on an co-manage our project “Integration and control of heat and power systems with variable loads” funded by the Next Generation SkT-MIT programme . * In September 2016, I was offered a Leading Research Scientist position in the Skoltech Center for Energy System. * In September 2016, I was awarded a first-class Master of Arts at the Université de Caen, France, and qualified as a European project manager. * In June 2015, I was awarded a grant to enroll in a postgraduate Master program at the Université de Caen, France, to train as a European project manager for one-year. Student life starting again from October 2015 to September 2016. * In January 2014, I was offered a visiting position as a Guest scientist in the Quantum Polaritonics Group of the Russian Quantum Center (2014). Dmitry Smirnov, 4th-year PhD student. Ilya Luchnikov, 2nd-year PhD student. Ilia Khomchenko, 1st-year Master student – Energy systems track. Roman Doronin, 1st-year Master student – Energy systems track. Valeriy Shevchenko, 1st-year Master student – Energy systems track. I will teach two graduate 6-credit courses during terms 2 and 3. Energy systems physics and engineering – starting term 2. The syllabus is available here. Nonequilibrium processes in energy conversion – starting term 3. The syllabus is available here (not fully completed yet). Both courses are suitable to Master and PhD students who have an interest in energy conversion physics and technology. Ученая степень: Ph.D, Университет Хериота-Уатта, Эдинбург, Великобритания, 2002 г.